Identification: Weber (1991, 1992) assigned sailfin catfishes to three genera and described this species as new under the name Liposarcus disjunctivus. Armbruster (1997), after a detailed systematic review, placed the genus Liposarcus into the synonymy of Pterygoplichthys. Weber (1992) provided a key and distinguishing characteristics and photographs of specimens; Armbruster and Page (2006) present a revised key to species in the genus Pterygoplichthys (except P. ambrosettii). Page (1994) also provided a few distinguishing characteristics. Measurements and counts for several Florida specimens were given by Ludlow and Walsh (1991). The dorsal pattern consists of light spots that become chevrons posteriorly. The abdominal pattern has dark and light vermiculations of equal width (Howells 2005). Pterygoplichthys and other suckermouth armored catfishes (family Loricariidae) can be distinguished from native North American catfishes (Ictaluridae) by the presence of flexible bony plates (absent in ictalurids) and a ventral suctorial mouth (terminal in ictalurids). Pterygoplichthys is often confused with Hypostomus: these genera can be distinguished by the number of dorsal fin rays (7-8 in Hypostomus vs. 9-14 in Pterygoplichthys). Native Range: Tropical America. The Madeira River drainage, Amazon Basin, South America (Weber 1992). Table 1. States with nonindigenous occurrences, the earliest and latest observations in each state, and the tally and names of HUCs with observations†. Names and dates are hyperlinked to their relevant specimen records. The list of references for all nonindigenous occurrences of Pterygoplichthys disjunctivus are found here. Ecology: Pterygoplichthys disjunctivus is a benthic forager, using its suctorial mouth to attach to surfaces and consuming detritus and algae. Nico et al. (2009b) and Nico (2010) describe a unique association between P. disjunctivus and wintering Florida manatees (Trichechus manatus latirostris) in artesian springs, where sailfin catfishes will attach to stationary manatees and graze on epibionts. Gibbs et al. (2008) examined the reproductive morphology and strategy of an introduced population of P. disjunctivus in Volusia Blue Spring, Florida. Females exhibited an increase in gonadosomatic index between May and September, indicating a summer breeding season. Multiple size classes of oocytes and a lack of completely spent ovaries suggest that this species is an asynchronous, multiple spawner (Gibbs et al. 2008). Means of Introduction: In Florida, probably originally introduced through fish farm escapes or releases, although aquarium releases cannot be ruled out. Aquarium releases in other areas. Status: Established in Florida, the species has recently expanded its range into several new drainages within the state (Nico, unpublished data). Established in North Carolina. Collected in Mississippi and Washington. Impact of Introduction: Largely unknown. In several natural streams in this species is relatively abundant. 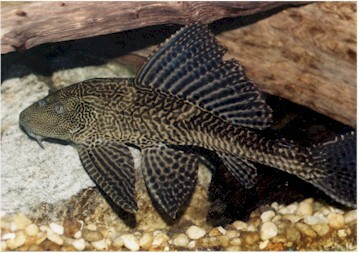 Because it grazes and removes attached algae, and also feeds on benthic organisms and detritus, this introduced catfish may be having a significant impact on the aquatic food base and, therefore, negatively effecting native invertebrate and vertebrate species (Nico, personal observations). Male members of the genus Pterygoplichthys dig out river banks to create burrows in which an attracted female will lay and guard her eggs. In large numbers, this burrowing behavior by Pterygoplichthys contributes to problems with siltation. In addition, the burrows potentially destabilize the banks, leading to an increased rate of erosion (Nico et al. 2009a). Remarks: Prior to its description, specimens of this species taken in Florida (Tampa Bay area) were reported as Pterygoplichthys multiradiatus or, in some earlier cases, as Hypostomus species. Pterygoplichthys disjunctivus specimens from the Hillsborough River drainage of Florida were tentatively identified as Pterygoplichthys cf. multiradiatus by Ludlow and Walsh (1991). Page (1994) followed Weber (1992) in using the name Liposarcus disjunctivus. The distribution and impact of this species in Florida, and that of other introduced armored catfishes, is currently being investigated by U.S. Geological Survey researchers. Sailfin suckermouth catfishes (Pterygoplichthys spp.) are capable of surviving mesohaline conditions (up to 10 ppt) for extended periods of time, allowing for the use of estuarine and coastal areas for dispersal (Capps et al. 2011). Voucher specimens: Florida (UF 79623, 89896, 98926, 100504, 115433, 126685, 148222, 148625, 160203, 166546, 169263, 169611, 171849, 178013, 184197, 184198, 184199, 184200, 184202; FDNR 18185). Armbruster, J.W., and L.M. Page. 2006. Redescription of Pterygoplichthys punctatus and description of a new species of Pterygoplichthys (Siluriformes: Loricariidae). Neotropical Ichthyology 4(4):401-409. http://dx.doi.org/10.1590/S1679-62252006000400003. Capps, K.A., L.G. Nico, M. Mendoza-Carranza, W. Arévlo-Frías, A.J. Ropicki, S.A. Heilpern, and R. Rodiles-Hernández. 2011. Salinity tolerance of non-native suckermouth armoured catfish (Loricariidae: Pterygoplichthys) in south-eastern Mexico: implications for invasion and dispersal. Aquatic Conservtion: Marine and Freshwater Ecosystems 21:528-540. Charlotte Harbor NEP. 2004. http://www.charlotteharbornep.com/NEP/minutes-2004/HCS2-19-04minutes.pdf. February 19, 2004, Punta Gorda, FL. Fuller, P.L., L.G. Nico, and J.D. Williams. 1999. Nonindigenous fishes introduced into inland waters of the United States. American Fisheries Society Special Publication 27. American Fisheries Society. Bethesda, MD. Gibbs, M.A., J.H. Shields, D.W. Lock, K.M. Talmadge, and T.M. Farrell. 2008. Reproduction in an invasive exotic catfish Pterygoplichthys disjunctivus in Volusia Blue Spring, Florida, U.S.A. Journal of Fish Biology 73(7):1562-1572. http://onlinelibrary.wiley.com/doi/10.1111/j.1095-8649.2008.02031.x/abstract. Howells, R. 2005. Exotic suckermouth catfishes (Family Loricariidae) in Texas waters. Texas Parks and Wildlife Department informational flyer. Austin, TX. Ludlow, M.E., and S.J. Walsh. 1991. Occurrence of a South American armored catfish in the Hillsborough River, Florida. Florida Scientist 54(1):48-50. Nico, L.G., H.L. Jelks, and T. Tuten. 2009. Non-native suckermouth armored catfishes in Florida: description of nest burrows and burrow colonies with assessment of shoreline conditions. Aquatic Nuisance Species Research Program Bulletin 9(1): 1-30. Nico, L.G., W.F. Loftus, and J.P. Reid. 2009. Interactions between non-native armored suckermouth catfish (Loricariidae: Pterygoplichthys) and native Florida manatee (Trichechus manatus latirostris) in artesian springs. Aquatic Invasions 4(3):511-519. http://www.aquaticinvasions.net/2009/AI_2009_4_3_Nico_etal.pdf. Page, L.M. 1994. Identification of sailfin catfishes introduced to Florida. Florida Scientist 57(4):171-172. Weber, C. 1992. Révision du genre Pterygoplichthys sensu lato (Pisces, Siluriformes, Loricariidae). Revue Francaise d'Aquariologie 19:1-36.